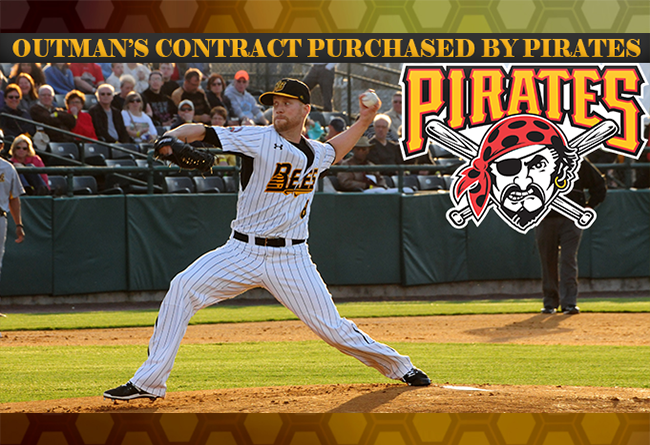 (New Britain, Conn., July 8, 2016) - New Britain Bees team officials today announced that starting pitcher Josh Outman has had his contract purchased by the Pittsburgh Pirates organization. He will report to Indianapolis (AAA). Outman made 14 starts for the Bees, tallying a 3-3 record and a 4.23 ERA with 55 strikeouts. The native of St. Louis, Missouri was the opening day starter for the inaugural New Britain Bees season. A veteran of Major League Baseball, Outman spent time with the New York Yankees, Cleveland Indians, Colorado Rockies, and Oakland Athletics before coming to New Britain, registering 274.1 innings in the majors while striking out 226. RHP Sean Gleason will start tonight’s game for the Bees in Outman’s place. Outman is the fifth Bees player to have his contract purchased during the 2016 inaugural Bees season, and second this week, joining Nick Greenwood (Minnesota), Josh Zeid (New York Mets), Cole Johnson (Arizona) and current Bee Eric Fornataro (Baltimore). The New Britain Bees are members of the Atlantic League of Professional Baseball and are in their inaugural season of play at New Britain Stadium. For further information or to reserve tickets, email tickets@nbbees.com, call 860-826-BEES (2337), or visit NBBees.com. The Atlantic League has been a leader in professional baseball and a gateway to Major League Baseball since 1998. Over 35 million fans have attended Atlantic League games and more than 800 players and 50 managers and coaches have joined MLB organizations directly from the ALPB. The Atlantic League emphasizes winning baseball games, showcasing the talent of top-caliber players and offering affordable family entertainment to metropolitan markets serving nearly 15% of the US population.